July 27, 2010 - The U.S. Department of Transportation (DOT) today assessed a civil penalty against Comair for violating federal rules regarding passengers denied boarding (“bumped”) on oversold flights. Comair and affiliated carriers were ordered to cease and desist from further violations and Comair will pay a civil penalty of $275,000. When a flight is oversold, DOT regulations require airlines to seek volunteers willing to give up their seats for compensation. If not enough volunteers can be found and the carrier must bump passengers involuntarily. The carrier is required to give bumped passengers a written statement describing their rights and explaining how it decides who will be bumped from an oversold flight. In most cases, passengers bumped involuntarily also are entitled to cash compensation of up to $800. This past June, the Department proposed raising the maximum denied boarding compensation to $1,300 and tying future increases to inflation. The Department’s Aviation Enforcement Office began an investigation of Comair’s compliance with the bumping rules following a number of complaints filed by consumers with DOT. The investigation involved a review of bumping complaints sent to Comair by consumers, as well as an inspection at the carrier’s headquarters of its consumer complaint records and its policies and practices for oversold flights. The investigation revealed numerous cases in which Comair failed to solicit volunteers to leave overbooked flights and provide passengers with the appropriate denied boarding compensation. The Aviation Enforcement Office also found that Comair had filed inaccurate reports with DOT on the number of passengers involuntarily denied boarding. Comair is a wholly owned subsidiary of Delta Air Lines headquartered on the grounds of Cincinnati-Northern Kentucky International Airport in unincorporated Boone County, Kentucky, United States, west of Erlanger, and south of Cincinnati, Ohio. Comair is one of the world's largest regional airlines and, with over $1 billion in annual revenue, would be considered a major airline carrier except for the fact that its aircraft seat less than 100 people. Another particularity of Comair's for an airline of its size is that the entirety of its fleet consists of variants of a single type, the Bombardier Aerospace CRJ. 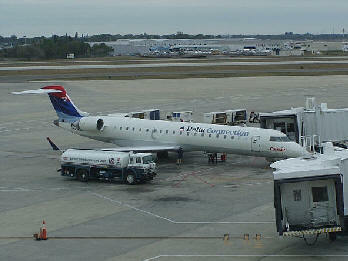 Operating under the brand name Delta Connection, Comair operates passenger services to a large number of destinations in the USA, Canada, Mexico and the Bahamas.